The health benefits of standing desks for adults have been touted for some time, but what about kids? JASWIG is an ergonomic furniture maker that realized a need for a child-friendly standing desk, so they made the StandUp desk that is capable of accommodating everyone from young children to adults. This innovative desk is made from sustainable wood with safety, health, and children’s educational potential in mind. JASWIG, a startup with offices in Belgium and the United States, created the StandUp desk, which is adjustable to serve people of various heights. The company launched a crowdfunding campaign this month and has already far surpassed their $54,753 goal with a week still yet to go. A height-adjustable desk like this seems like a perfect addition to spaces where multiple people need to use the same desk, such as schools, where a StandUp desk could be used by students of almost any age or even by teachers. Mathias Ellegiers, the company’s co-founder, says the StandUp is also a good fit for the home. “Parents particularly like the desk because it fits the whole family,” said Ellegiers. “Both mother and son can use the same desk.” The flexible furniture is also quite easy to assemble. The nine pieces of the desk can be put together with the included hardware and an Allen wrench, much like other flat-pack furniture. Standing desks are known to improve posture and core strength, which are important to foster in young children. There’s also some evidence to suggest that standing leads to better blood and oxygen flow, which stimulates brain activity to sharpen focus and lengthen attention span. For kids interested in standing while learning, the StandUp offers a flexible alternative that grows as they do. The desk’s design is adjustable, but it does come in three size ranges: small, medium, and large. The small version can be used by children as young as six years old, and the height can be adjusted in all three models in as little as one second, due to the nature of the design. The health benefits of standing desks�for adults have been touted for some time, but what about kids? 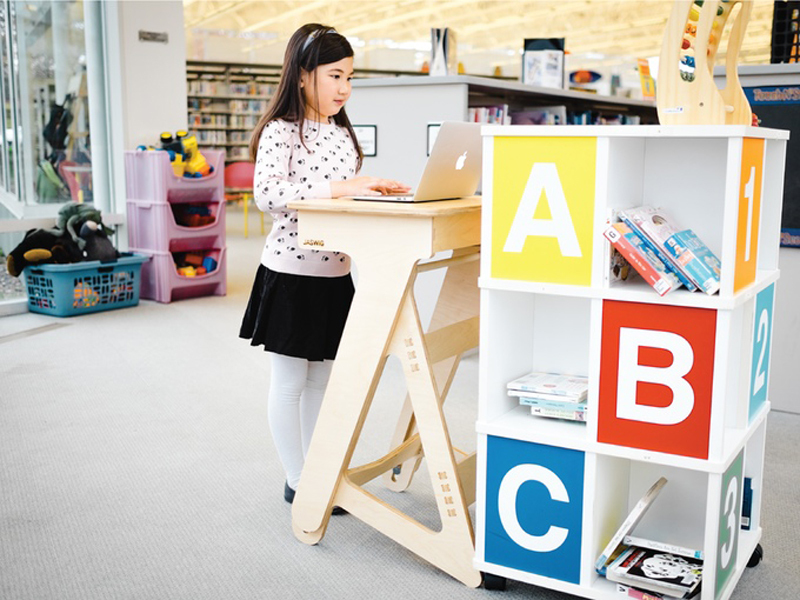 JASWIG is an ergonomic furniture maker that realized a need for a child-friendly standing desk, so they made the StandUp desk that is capable of accommodating everyone from young children to adults. This innovative desk is made from sustainable wood with safety, health, and children's educational potential in mind.